LinkedIn: How did it Begin? Just like how Facebook have Zuckerburg, LinkedIn also has its own founder – Reid Hoffman. According to Hoffman, he was interested in the idea of having a network exclusive for professionals. Especially on how it would impact the way people would do business. – And this is how LinkedIn came to be. For more detailed insights on LinkedIn and its milestones, I highly recommend reading this: Our Story by LinkedIn. Since 2003, people use LinkedIn to look for jobs. Most people used LinkedIn as a digital resume site while others looked for connections. Even as far back as 2012, LinkedIn cited that 50% of their revenue came from offering hiring solutions to recruiters. LinkedIn CEO Jeff Weiner wanted to change the site’s current reputation. And so in 2014 he announced his vision for LinkedIn to be the world’s first Economic Graph. It’s a feature that will provide a map for the digital economy. Recently, LinkedIn added a new service called Profinder. It is a page allotted for people who are looking for someone to hire or offer special freelance projects to. On-site features like Pulse, Groups, Home feeds, Influencer and SlideShare are dedicated to improve LinkedIn’s Content Marketing distribution channels. According to PewInternet.org, majority of LinkedIn users check their accounts less than a week at a time. Since it’s a Professional Social Network, most people that engage with LinkedIn are those belonging to the professional age. The survey shows that LinkedIn is comprised of fresh College graduates and working-age adults. It is also popular with businessmen and young entrepreneurs alike. So who actually uses LinkedIn? This slide shows which countries participate in LinkedIn the most. But this doesn’t mean that if you’re not in these sectors LinkedIn would not be right for you. In fact, here’s a video that focuses on how small businesses can use LinkedIn. In the Google Hangout Video above, Jason Miller, a Senior Content Marketing Manager in LinkedIn, gives the Google Small Business Community some amazing advice and insights on what entrepreneurs can do to fully utilize the benefits that LinkedIn can give them as an entrepreneur as well as the advantages it has for their businesses. Below I’ve summarized the things discussed by Jason, highlighting the most important points he mentioned and adding a few helpful tips of my own. Note that this does not necessary go in the same order as how it was in the video. Jason Miller stated that having a good head shot as your LinkedIn picture is important. Personally, after I have learned about this it had me thinking that it is indeed more suitable to have a head shot that evokes the feeling of professionalism. Considering that the majority of the crowd in LinkedIn are professionals and entrepreneurs, we have to try and put our best foot forward in order to gain an audience. Providing a good head shot alone already contributed a lot in improving my profile’s professional feel. We have to remember that even if LinkedIn is a social media website, it caters to a different level of audience. Snapping a selfie and setting it as your profile picture is more acceptable on Facebook, Twitter or Instagram. But when you’re in LinkedIn, try to set aside your relaxed, casual self and highlight your professional edge more. Represent who you are in the best light possible. Another great thing about LinkedIn is that it allows the users to have their own customized URL and not just random confusing numbers at the end. Customizing your Public Profile URL can make your personal profile look professional. Plus, it’s more presentable if you decide to put it in your resumé or on your business cards. Another advantage to a personalized URL is that it increases your external visibility on search engines. This can help you greatly in building your personal branding since it will be easier for people to see you when they search for your LinkedIn profile. Upon signing up for a LinkedIn account, try to focus your attention first on establishing your personal profile. Make sure all the appropriate information needed to verify your professional capabilities are stated clearly for all the people in your network to see. Don’t overlook the importance of having a Summary since this is equivalent to your objectives in a resumé. It’s up to you if you want it to be lengthy and detailed or short and straight to the point. Just make sure that the content you put in are engaging and relevant. Provide a short video presentation or a related image to your summary for it to be more enjoyable for people to read. Considering LinkedIn’s numerous users worldwide, the only way for you to build up your own personal branding is by optimizing your profile for LinkedIn’s search algorithm. Your professional headline won’t be able to help you a lot when it comes to boosting your search rankings since there may be a lot of LinkedIn users with the same Job Title as you. If you do want to be seen, try putting in unique keyword phrases in your headline. It gives you a bigger chance to rank first on the LinkedIn search. Never disregard your profile summary. Just like what you would do in a website, try to toss in a few keyword phrases when you describe the gist of what you do as a professional. Avoid repeating the same keywords over and over because that will not really help much in giving you the search benefit you need. Try to optimize with secondary keywords that are still relevant and are descriptive of your skillset. The experiences, skills and interests section of your LinkedIn profile are all hotspots for keyword phrases as well. Make sure to utilize each of these areas wisely so that you may be able to help your profile get to the higher ranks. Using anchor text links is also a great way to boost your profile’s SEO. LinkedIn allows users to list as many as 3 links. Don’t settle for the default options. Instead, customize the anchor text in your URLs to make it even more SEO-friendly. Note that LinkedIn profiles are highly optimized for Google’s search algorithm. If you have a LinkedIn account and people look for you using Google search, your profile will likely be posted on the first page. Make sure every area of interest is filled up with relevant information about yourself and your professional background. Normally when a person searches for others on LinkedIn, the results are generated from their personal network and up to 3 degrees of connections beyond the people they know. In order for your LinkedIn profile to appear in search results, what you need to do is to be part of as many relevant LinkedIn networks as possible. Being overly cautious as to who you connect with will actually do you no good. This doesn’t mean that you should connect with anyone and everyone. What I’m trying to say is that you should try to consider the people who want to be included in your network even if you don’t know each other personally. This can be a great way for you to discover other people outside your network that would actually benefit you in the long run. Moving on to the business reputation building aspect of LinkedIn, I’ve also enumerated some of the things Jason Miller discussed that can aid individuals with businesses to build up their company’s reputation. Whether it is a start-up or a full blown company, through LinkedIn you can showcase all the products and services you offer. Sharing Company updates is a great way to connect to your audience. Try to post updates at least once a day to show your audience what’s going on with your business. Try to be as relevant and as helpful as possible when it comes to sharing any type of content. Publishing blogs that would peak people’s interest is also a great way to build an image. Write about topics that people in your network will appreciate and make sure that the content will be able to help them in their own endeavors. Jason Miller mentioned that the type of content that works well in LinkedIn are inspirational, story-telling and educational content. You can also experiment with a little entertaining content from time to time if you want to. Everything depends on you and your choice of approach. Since it’s a blog, you don’t have to stress yourself too much with what you want to say. What’s important is you get your thoughts out there because sharing insights is one way you can grow your audience. Aside from those mentioned above, another great way to utilize your company page is by using Showcase pages. This feature in LinkedIn Company pages allows businesses with multiple brand messages to make individual pages for each of their products or services that targets unique audiences. While the company page is still the central messaging hub, showcase pages serves as extensions to give focus on specific areas. If you want to know more about this, I suggest you read Jason Miller’s article on How to Use LinkedIn Showcase Pages. Keep in mind that the LinkedIn Company Profile’s purpose is not solely for advertising your products or services. Instead, you should make use of all its features in order for you to engage with those who might be interested in what you do or sell. This also gives you a great opportunity to be able to build a relationship with potential customers or partners. If you’re looking for an in depth discussion about LinkedIn’s company page and how you can start making one for your business, I highly suggest you watch Johnny Campbell’s webinar about How to best use a LinkedIn Company Page. Similar to that of a website, the LinkedIn Company Page also has its own analytics tool that shows the metrics and trends happening within the page. The Analytics tab is divided into 3 categories which are Updates, Followers and Visitors. The updates section shows a table that displays the page’s most recent updates, a graph of your posts’ engagement trends showing the number of times it was seen both organically and through paid campaigns and lastly is a graph displaying the number of times LinkedIn members clicked, liked, commented on, and shared your content in both organic and sponsored campaigns. Jason Miller stated that LinkedIn analytics allows you to see who’s following your company page by demographics. Using the drop down menu, you can choose whether you want to see it by Seniority, Industry, Job function or Company size. This audience breakdown can help you determine who are interested in your products and services. Aside from that, you can also see which updates posted on the company page are getting the most engagements. Use this as a strategy to know when you can venture into paid promotion whenever a post garnered good engagements so that you can expand your audience reach further. We already know that LinkedIn is the leading social media platform that caters specifically to professionals all around the world. With its growing community that surpasses Facebook and Twitter combined, it’s a hotspot for the marketing and business people alike. There are 4 key aspects why LinkedIn is the best social media to use for both marketing and business purposes. Ensuring your profile visibility is easy once you know the proper strategy to do. Most of it were already mentioned above including customizing your LinkedIn URL and putting in anchored text. Placing keywords in your profile headline, summary and experience review can also help you to be searched easily. Probably one of the best ways to let people know about you and your business is by expanding your network. Add more connections and be part of different LinkedIn groups. By doing this, it can greatly contribute in building your reputation in LinkedIn. You’ll be able to socialize with the pools of different professionals that belong to the same industry as you or those that share similar interests. Just like any other social media, LinkedIn allows you to communicate with all the people that belong in your personal network. There are a number of ways for you to do this. 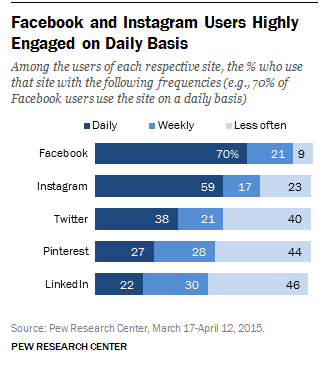 The most basic one is by posting daily updates and liking or commenting on people’s posts. This is to start of a discussion between you and others that belong in your connections’ networks. Share your insights and communicate all your ideas by posting blogs either within your personal profile or you can publicly post it on LinkedIn Pulse. As important as it is to get your thoughts out there, don’t forget to acknowledge the things that your connections post. If they blog, give extra effort by reading and commenting on what they have shared. This is an effective way of creating synergy in the blogging community. By making an outstanding LinkedIn profile, you can catch twice or even thrice as many attention than those that just make an account for the sake of having an account. When you sign up for LinkedIn, make sure to fill out all the important fields. The same goes for company pages. Don’t leave out any details and build yourself up as much as you can. Share all your achievements whether it be in academics or in your past employments. Provide concrete proof of all your stated accomplishments to make it more believable and authentic to potential connections. It’s always better to validate all your claims by showing visual representations. People are not only after what you do as a professional but also what you can offer them in return. Balance everything out by stating what you have achieved, but give more emphasis to what you can do for other people. Show concrete examples of how they can benefit from you and what you do. Do the same thing when making content for company pages. State important details but focus more on the value that your products or services can give people. Utilizing LinkedIn to its full potential can bring you so much benefits in the long run. With today’s technology-savvy individuals, pretty soon majority of the biggest companies will opt to make a background check by looking through a potential employee’s LinkedIn account. It’s up to you to start improving your profile so when the time comes you’ll be on top of your game. 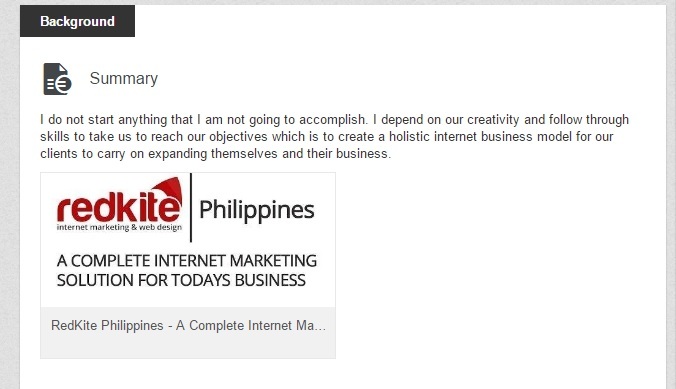 This and more if you get in touch with us, a trusted digital marketing company in the Philippines!